The Luxor Hotel Las Vegas is a hotel and casino located on the Las Vegas Strip. Construction of the Luxor Hotel started in 1991, the same year that Treasure Island also began building. The Luxor Hotel Las Vegas has a highly modernized and contemporary design and contains a total of 4,407 rooms lining the interior walls of a pyramid style tower and contained within twin ziggurat towers that were built as later additions. The hotel is named after the city of Luxor in Egypt. In July 2007, owner MGM Mirage announced plans to thoroughly renovate the Luxor Hotel Las Vegas, spending $300 million to remodel 80 percent of Luxor's public areas, removing much of the ancient Egyptian theme and replacing it with more adult-oriented and modern lounges, restaurants and clubs. 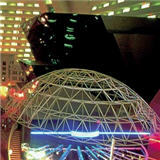 Among the distinctive changes to the exterior occurred in mid-2007, when management covered one of the pyramid's massive black faces with a 15-story sign that advertises Absolut Vodka. On June 16, 2008 the sign was taken down. The Luxor Hotel Las Vegas is located on the southern end of the Las Vegas Strip, opposite the McCarran International Airport. The resort is flanked by the Mandalay Bay to the south and by the Excalibur to the north. All three are connected by free express and local trams. All three properties were built by Circus Circus Enterprises, which later became Mandalay Resort Group. When the Luxor Hotel and Casino opened on October 15, 1993, the pyramid was the tallest building on the strip and took 2 years to build using a total of 968 workers. The cost was $375 million to build. A theater and two additional hotel towers totaling 2,000 rooms were added in 1998 for $675 million. In June 2004, the Mandalay Resort Group was purchased by MGM Mirage, adding this hotel to its vast array of properties on the "Strip". When the Luxor Hotel resort opened, it featured a river that encircled the casino with a ferry that would carry guests to different parts of the pyramid. After guests complained that the ferry service took too long, it was turned into the Nile River Tour, a river ride that passed by many pieces of ancient artwork. Most of the ancient Egypt theme and the river ride were taken away as part of a campaign to tailor the property towards more upscale tastes in 1995. 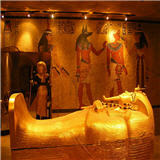 The Luxor Hotel resort has been home to some popular entertainment attractions in the Las Vegas area. The main level featured the nightclub, RA, which closed indefinitely on 2006. From 2000 to 2005, the Luxor Theatre was the home of the enormously popular performance-art show Blue Man Group, which has since moved to The Venetian. On February 15, 2006, the main theater became the home of the musical Hairspray which ran until the end of the year. In 2006, MGM-Mirage began completely remodeling the Luxor Hotel. Rooms in the East and West Towers have been refurnished. Two upscale restaurants, Isis and Sacred Sea Room, were closed. This space became CatHouse and the renowned Company American Bistro. The RA nightclub, which had previously been one of the most successful in the city but had been seeing reduced attendance in recent years, was shuttered. Replacing it is the Las Vegas branch of LAX, a Los Angeles nightclub, which opened on 2007. The Luxor Steakhouse was renovated and reopened as Tender Steak & Seafood. The IMAX is now used to host a human bodies exhibition, and the IMAX theater houses an exhibition on the RMS Titanic. Illusionist Criss Angel signed a deal in 2006 to tape episodes of his TV series Mindfreak at the Luxor Hotel. Angel currently has a production office and store in the Luxor. 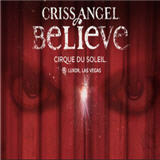 In 2008, Criss Angel starred in a new magic-themed Cirque du Soleil production at the Luxor Hotel Las Vegas. The Luxor Hotel and Casino is among the most recognizable hotels on the strip because of its striking design. Designed by hotel architect Veldon Simpson, the main portion of the Luxor Hotel is a 350-foot-high, 30-story pyramid of black glass. In comparison, the Great Pyramid of Giza with original capstone topped out at 481 ft. The footprint of the pyramid is a 556-foot square. The Luxor Hotel is marked by a large obelisk with the name of the property in lighted letters, while the porte-cochere travels underneath a massive recreation of the Great Sphinx of Giza. The pyramid was originally conceived with a tram connecting the north side of the Luxor Hotel with the neighboring Excalibur Hotel and Casino. This was soon removed for later property changes. A second tram linkage now connects the east-facing side of the Luxor pyramid with both the Excalibur and Mandalay Hotel and Casino. The Luxor pyramid is clad in very dark bronze glass, which appears black on clear days and a dark, golden-bronze on overcast days. There are 30 guest-room floors, six higher service floors, including the SkyBeam penthouses. Many of the original aesthetics of the external property have been eliminated. The original front water and laser show was the first to be removed. The laser show was stopped due to complaints of stray beams illuminating aircraft on approach to the very nearby McCarran international airport. The fountains themselves were removed and replaced by a parking lot and the new tram station. In addition, the Starlight Lighting System, a nightly remote-controlled show of lights along the pyramids corners powered by thousands of circuit boards and computer chips, was scaled back due to technical difficulties. The tip of the Luxor pyramid contains a fixed-position spotlight that points directly upward and is claimed to be the brightest beam in the world at over 42 billion candle power. It is visible from anywhere in the Las Vegas valley at night, and can be seen at flight level from above Los Angeles, California, over 275 miles away. In the spring, the bright light attracts huge numbers of moths into the light beam, creating a phenomenon that has been likened to snow. 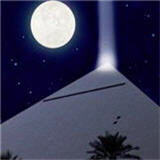 It is also claimed that this Luxor pyramid light beam can be observed from outer space.